I know most people's thoughts are on the Worldcon right now, and congrats to all the Hugo winners. But last weekend was Bubonicon here in Albuquerque, and thanks to Steven Gould, Brian and Rosie and I got a chance to attend opening ceremonies Friday evening and then to dine with him, Walter Jon Williams, and Walter Jon's lovely partner Kathy. Also thanks to Steven, the first App Rosie requested for our Kindle was Angry Birds, which he let her play with on his iPad during both opening ceremonies and dinner... (along with other apps). 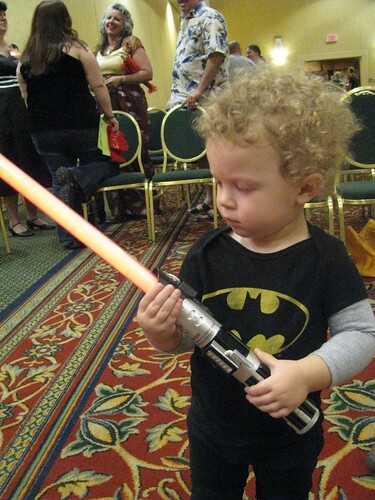 We also checked out the dealer's room and the art show, but didn't come home with anything new. Got many compliments on Rosie's cuteness, though - she'd decided earlier that day to wear a party dress, so I'd added a star necklace and a wand with a star on it (left over from her birthday) to make it into a fairy costume of sorts (though mostly I had to carry the wand, after Rosie dropped it somewhere and the kind folks at Registration gave it back to me). Saturday morning, Brian watched the kiddo so I could attend a panel on "The bucket list" of books you should read in the genre (and out of it, a category moderator Connie Willis included along with "classics," "recent works that may become classics", "overlooked works," and a couple other very interesting categories). Willis and Daniel Abraham probably made the most interesting sounding recommendations, and I've already bought one: The Apex Book of World SF. They had only a short period of audience suggestions at the end, so I didn't get a chance to mention Nnedi Okorafor's Akata Witch, but I did suggest it to Connie in person afterward, and Steven told me that it was brought up during his YA panel later. We went home for lunch and naps and then Brian headed to his regular weekly gaming session and I went back to the con. 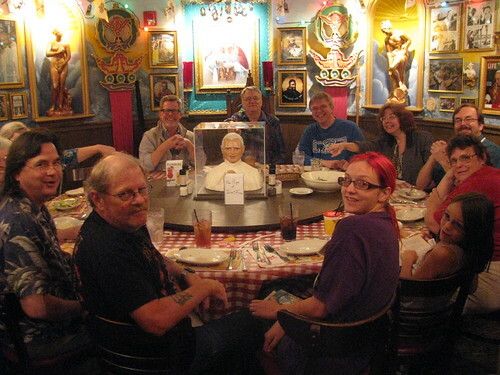 By prior arrangement, Rosie and I joined Steven again for dinner, this time with a group of fen headed to Buca di Beppo. There were 13 of us and by chance they had the Pope room available, so we had the, er, interesting experience of eating dinner with the pope's upper half in a box sticking out of the food turntable, and looking at whomever he faced. Much tasty food was consumed, with much left over (even though we tried to account for it, those pasta dishes are huge!). The group also entertained itself by leaving decorations in the room for the next group, which was known to be George R.R. Martin's party. I had balloons with me (for the kiddo to play with), and Steven had a sharpie, so that helped. More pictures are over on the flickr account.